So you want to visit the Blue Mountains while you are in Sydney, but you can’t decide if you need to book a guided tour or if you can do it alone using public transport or a rental car? Well read on, we have all the info you need to make an informed decision and a bunch of pages to help you plan a perfect trip to Katoomba and beyond. 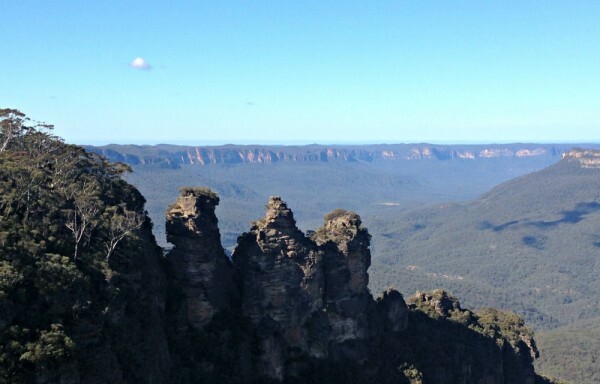 How to plan the perfect visit to the Blue Mountains. When is the best time to visit the Mountains? How long do you need to explore the Blue Mountains? 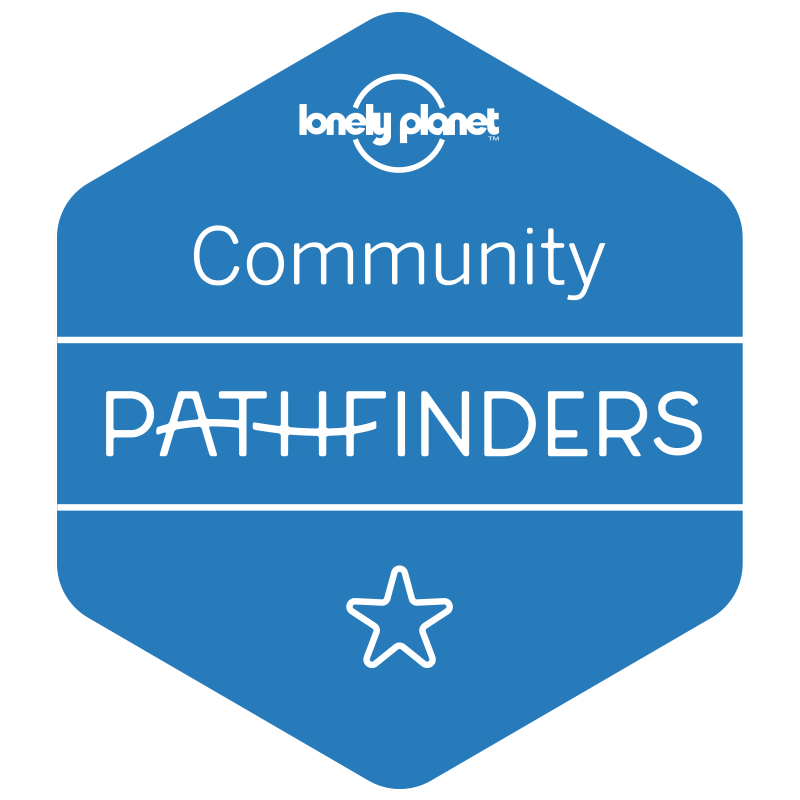 Which Blue Mountains Bushwalk should you do? 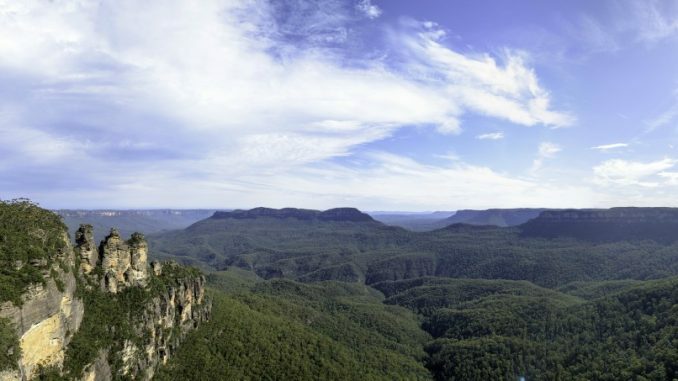 The Blue Mountains is a world heritage wilderness that begins 60km west of Sydney. Spending a day visiting the mountains makes a great addition to a Sydney itinerary. The mountains are not mountains but rather a valley that was formed over 50 million years ago. 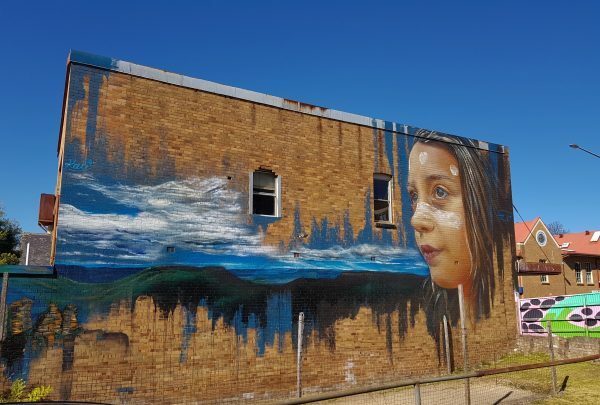 The mountains are the perfect distance from Sydney for a day trip, which will give you a taste of the region but a full weekend is the ideal amount of time to experience the area. 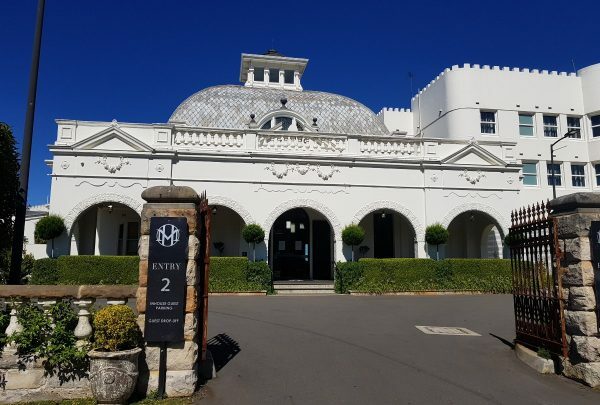 Read on, and I will highlight the main sights and attractions you can cover in a short visit, namely Wentworth Falls, Leura, Katoomba and Blackheath. Hopefully, this will help you decide what type of visit is right for you. First things first, why are the Blue Mountains blue? Your first decision is, do you want to go it alone or take would you prefer a tour with an experienced guide? There is no short supply of tours to the region with prices starting from $75 and reaching several hundred dollars per person for private or longer tours. A knowledgeable commentary along the way, someone to explain what you see and its significance. We have done extensive research on the day tours available to help you work out what to look for when choosing one to suit you. It is significantly less expensive than a tour. You can have a day in the Blue Mountains for under $3 if you know the tricks. 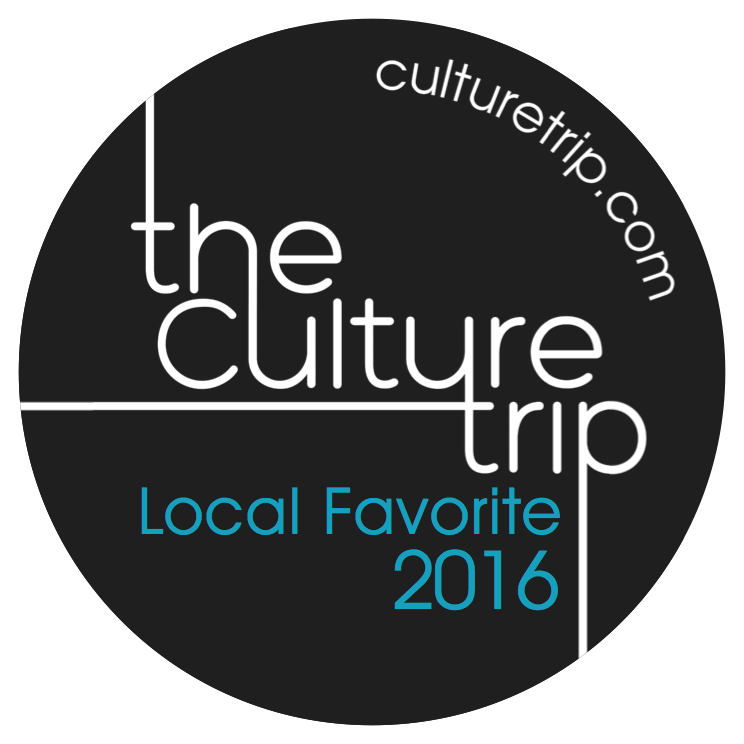 You can visit spots off the tourist trail and find lots of great hidden gems. You can take longer hikes than those offered on tours. The train from Central Station in Sydney takes approximately 2 hours to reach the mountains. The return trip can be made using a variety of tickets. It is most economical to travel off-peak return (before 7 am or after 9 am on weekdays or all day Saturday) at $6.80 each way using an Opal card. If you leave Sydney between 7 am, and 9 am it costs $8.69. On Sundays, you can make the trip for just $2.70 return. However, the trains will be jam packed so consider that when deciding. Go during the week for a less crowded experience. If you don’t mind paying the peak fare there is an 8:50 am limited stops train that reaches Katoomba at 10:32 am. This is the first express train. Monday to Friday the best trains to get are the 6:23, 6:53, 7:23, 8:18, 8:50 or the 9:18 am services. On weekends and public holidays, more services head up to the mountains, but they will be crowded. The best options are the 6:24, 7:24, 7:54, 8:24 am trains. Check these times are still correct here. Tip: For the best views make sure you sit on the left side of the top deck. Which stops should you include in your visit to the Blue Mountains? Katoomba, the main centre of the Blue Mountains is approx 120km west of Sydney city and takes approx 1.5-2 hours to reach depending on traffic and your mode of transport. Katoomba – Main town centre in the mountains. The starting point of the HOHO bus, home to the 3 Sisters, hotels, shops and restaurants. I have put together some itineraries to help you most the most of your time in the mountains. The Blue Mountains for anyone with impaired mobility, the elderly or young kids. What is the best way to get around in the Blue Mountains? If you are heading up by train, it makes sense to pick up the hop on hop off service for seamless exploring the mountains more accessible. 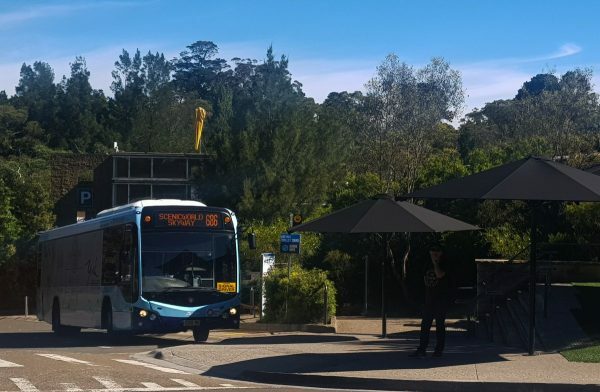 You can get to most of the attractions by public buses (route 686 is a loop from Katoomba Station to Scenic World via Echo Point), but it does require a bit more effort to make sure you can find the stops and bus routes you need. The mountains HOHO is called the Blue Mountains Explorer Bus and has 29 official stops. It is an excellent service and covers all the main areas between Katoomba and Leura and includes limited stops to Wentworth Falls. There are three ticket options, the basic ticket is valid for one day and cost about $44, there is also a ticket that includes Scenic World. I am not always a fan of HOHO buses, but this one is excellent. The drivers give great live commentary. They seem to go above and beyond what you would expect, giving passengers a few minutes at some of the smaller stops to grab a pic and get back on the bus rather than having to leave the bus and wait for the next coach in places that you don’t need to spend much time exploring. The Blue Mountain region can be visited year round. The temperatures are a little more extreme than Sydney and range from a daytime average of 16°C (60F) in winter and 29°C (84F) in summer. The area hosts several big festivals which can push accommodation prices and crowds up but are also a lot of fun to join in. You can check the region’s festival calendar here. 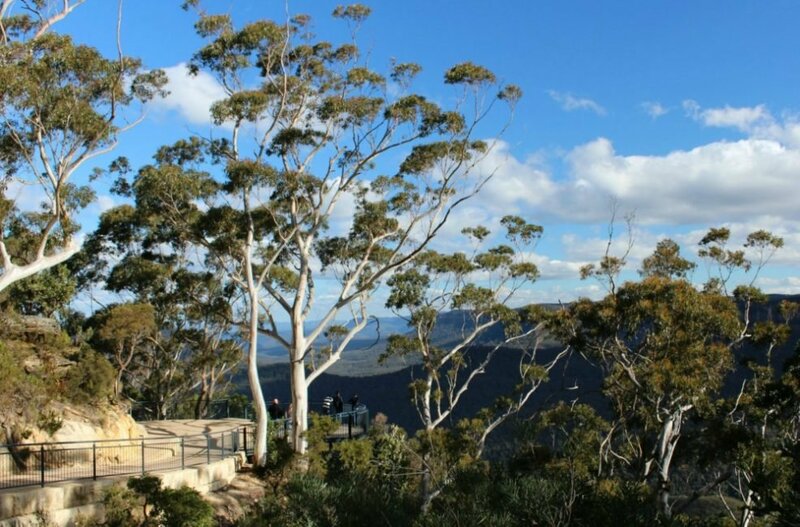 You can get a good taste of the Blue Mountains in a day, albeit a rather long one if you are coming from Sydney, but if you here on a extended visit an overnight stay will reward you with some fantastic views and great memories. Keen bushwalkers can easily find enough to do here to stay for a week! For me a 2 or 3-day visit is ideal but if you don’t have the luxury of time, then one day is still a great option. The Three Sisters, the iconic group of sandstone rocks at Echo Point, are a short ride or even a walk from Katoomba train station. They are the areas most visited attraction. Busloads of tourists flock here each day on day tours from the city, and it can get a little crowded sometimes, but it’s still well worth a visit. The ‘sisters’ are floodlit from dark until 10.30pm each night. They look equally amazing no matter what time of day you visit and even a foggy day can provide a great photo of the rocks piercing the fog. 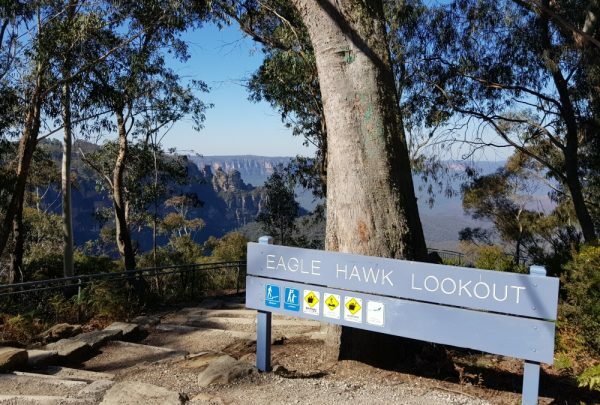 If you have a car check out the alternative view of them from Eagle Hawk Lookout – same great view with no tour buses in sight, the HOHO bus also stops near here. Why are they called the Three Sisters anyway? There are numerous waterfalls in the Blue Mountains, but my favourite – and among the easiest to reach without a car is Wentworth Falls. There is a walk called Darwin’s walk (after Charles Darwin) that begins at Wentworth Falls station and ends at the falls. It takes a little under 2 hours to complete and is a pretty easy walk. If you want to swim at the bottom of the falls, the Wentworth Pass Track will be the best one to follow. If you decide to eat in the area, the Conservation Hut offers good food with great views. There have recently been some landslides in this area so check the Blue Mountains National Park website before you plan any walk in this part of the park. Almost everyone who heads to the Mountains ends up at in Scenic World; it is by far the most popular man-made attraction here. The Scenic World complex is home to 3 experiences. The Scenic Railway – Ride the railway with the steepest incline in the world at 52 degrees. By far the most useful of the rides here as it saves you walking but up from the valley floor below. The railway was originally built as a way to bring coal from the Katoomba coal mine on the valley floor. The mine only operated for 21 years, and today this track, which travels 405 metres to the top of the mountain is used to transport visitors to the boardwalk below. 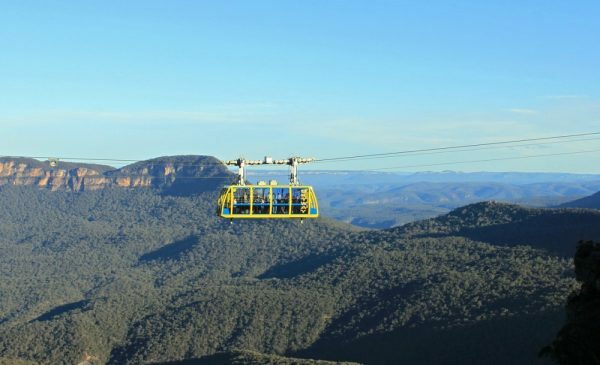 The Scenic Skyway – Travels 720 metres across the Jamison Valley providing incredible views of the 3 Sisters and Katoomba Falls. The Skyway has a glass floor that allows views of the valley below. The Scenic Cableway – I have not personally tried the cableway since it was replaced a couple of months ago. The cable car descends 545 meters to the floor of the Jamison Valley. You can then follow a 3km scenic walkway to the Scenic Railway for the ride back to the top. This ride is wheelchair accessible as is the first section of the walkway. It is also the steepest aerial cable car in the Southern Hemisphere. The queues here can be pretty bad mid-morning, so I suggest heading here first up or later in the afternoon. If you are travelling in peak season (summer) it’s a good idea to pre-purchase your entry tickets. You can combine them with the HOHO bus to make things reasonably seamless. The first stately homes were built in the mountains in the 1870s. Katoomba was developed in the early 1900s as a mountain resort area and quickly became popular with Sydneysiders wanting to relax in a colder climate. The district took off in the 1920-1930s resulting in a good number of art deco styled buildings. Katoomba main street is a good spot to stop for lunch with some excellent examples of Art Deco and Art Nouveau architecture to explore. 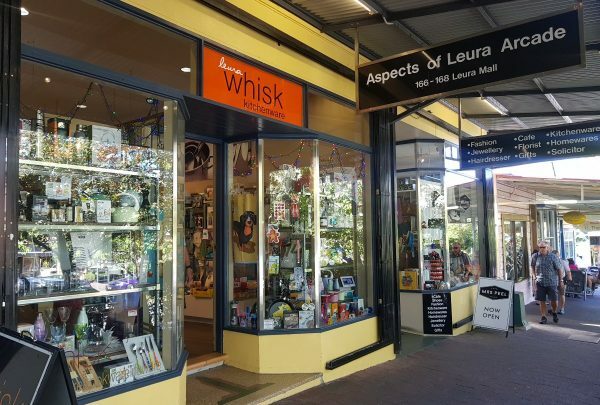 Leura village, located between Wentworth Falls and Katoomba, is a postcard-pretty village with beautiful gardens, a high street of quaint shops, and a variety of cafes and restaurants. Sublime Point Lookout – Leura is the closest town to Sublime point that is just as its name says, sublime! Garden lovers should try to time their visit with the annual Garden Festival held each Oct/Nov. Bygone Beauties – Check out the world’s most extensive teapot collection while enjoying afternoon tea. Solitary Restaurant – There has been a cafe on this site since 1913. These days you can either grab an all-day breakfast in the garden or dine in the restaurant — great views. Josophan’s Chocolate – An experience for your eyes and your taste buds, we always stop off here for a little treat. 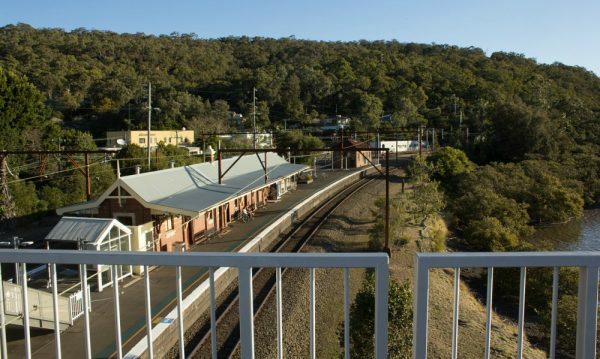 Blackheath is one of the last train stops in the Blue Mountains proper. 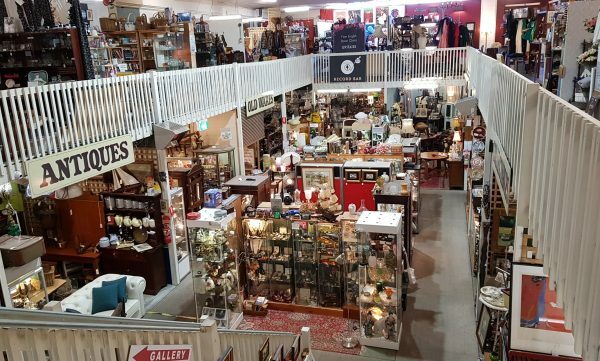 The town centre by the station has quite a lot to offer with lovely cafes, galleries and the fabulous Victory Theatre Antiques Centre. It is also home to the famous Rhododendron Gardens. If you are only in the mountains for a day, you will have to choose between Wentworth Falls and Blackheath as there is not the time for both. I suggest taking the train directly to Blackheath if you intend to visit. From the station, it’s a 3km walk to Govert’s Leap Lookout, and from here you can take the track to Evans Lookout. This is a medium grade 3-hour walk. You would need to take a taxi or rideshare back to Medlow Bath or Katoomba Station. Even if you have limited time, you should take at least one short walk. You don’t have to be super fit to walk here; there are walks to suit all levels of ability. This walk is a little over 3km and takes about 1 hour 45 mins. It brings in Prince Henry Cliff walk about and also passes Honeymoon Lookout. There is a map with full instructions on the Wildwalks website. Do you choose 1000 or 800 step staircase down to the valley floor below? This 4km walk begins at Scenic World and takes about 2 hours. If you plan to stay overnight in the mountains choosing which pretty village to stay in can be hard. If you do not have a car, then I would recommend Katoomba or Leura. There are lots of shops and restaurants, and the hop on services stop here. 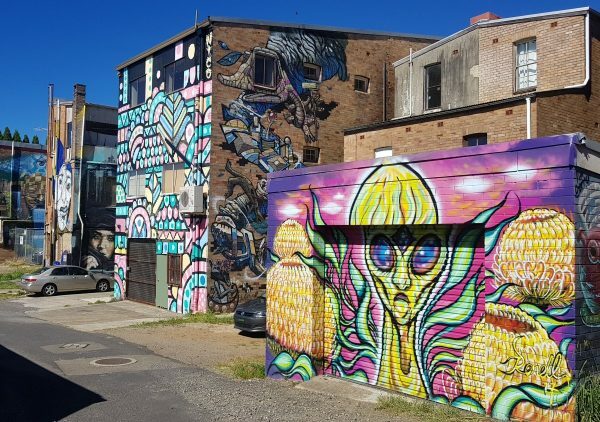 If you are on a budget, Katoomba is the better option. The food is generally cheaper here, and it’s also home to a great Youth Hostel (YHA). There are also some great pubs or and houses further up the mountains in Blackheath if you are making the trip by car. 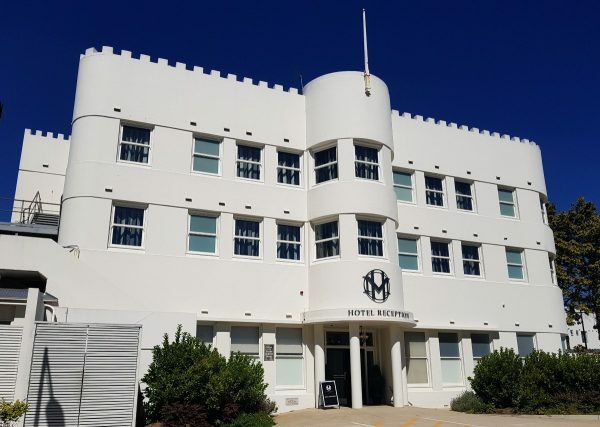 The Heritage listed Hydro Majestic is one of the iconic buildings of the mountains with an exciting past. The hotel, built by department store mogul Mark Foy, opened in 1904 and was made in a mix of Edwardian and Art Deco styles and includes a domed roof that was brought in from Chicago. During World War 2 the hotel was turned into a hospital for US Soldiers. Sir Arthur Conan Doyle was a guest here, Opera Singer Dame Nellie Melba performed here, and the country’s first Prime Minister died here. Over the last few years, the hotel has undergone considerable refurbishment, and the views from the public rooms are truly spectacular. If you love art deco, you will love this place. It’s one of the most unique hotels in the country. Even if you don’t spend the night here, you should stop in for high tea. The views over the mountains from this hotel win me every time. We are partial to boutique hotels because we love the friendly feeling they offer. With just 14 rooms and helpful, warm staff Echoes do this well. The rooms here are more spacious than many of the older properties, and the facilities are excellent. I would stay here again in a heartbeat. Take a look at the spectacular views on the TripAdvisor reviews. I am sure you will as impressed as we were. The Carrington opened in 1883 and was a favourite spot for Sydney’s elite to escape the city. It was once said to rival Raffle in Singapore. 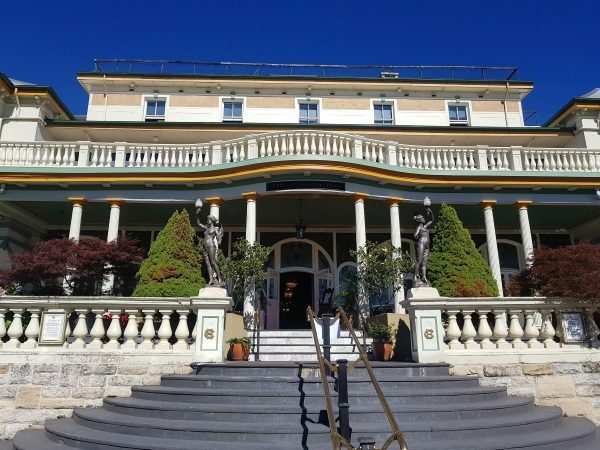 The hotel continued to operate for over 100 years before closing for over a decade and undergoing six years of restoration. The refit is true to the period with lots of lovely details, and many of the public areas feel like you have stepped back in there. There are not a lot of mod cons here but there is everything you need for a comfortable stay and the location right in Katoomba is great for dining and exploring. If you prefer resort style accommodation to smaller old world properties, it is worth taking a look at Fairmont. The hotel is pet and family friendly with 200 rooms of varying styles. They have several restaurants and a spa to keep you busy when you are done exploring the many walks in the mountains or when the weather is against you. You don’t need a champagne budget to make the most of an overnight visit to the mountains. The YHA is a great budget choice with an excellent central location close to the station and shops for supplies. There is a pool table, a giant outdoor chess set and a large communal kitchen. The common room features a large open fireplace that is a perfect spot to curl up with a book in winter. 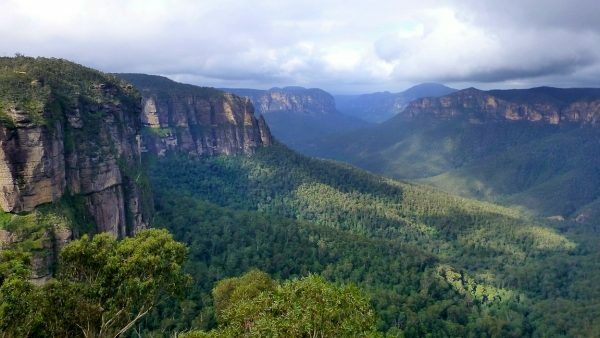 While Australia has a reputation for dangerous creatures and the like the Blue Mountains is a safe destination and fine for solo travellers. Can you add anymore must visit places to my list? 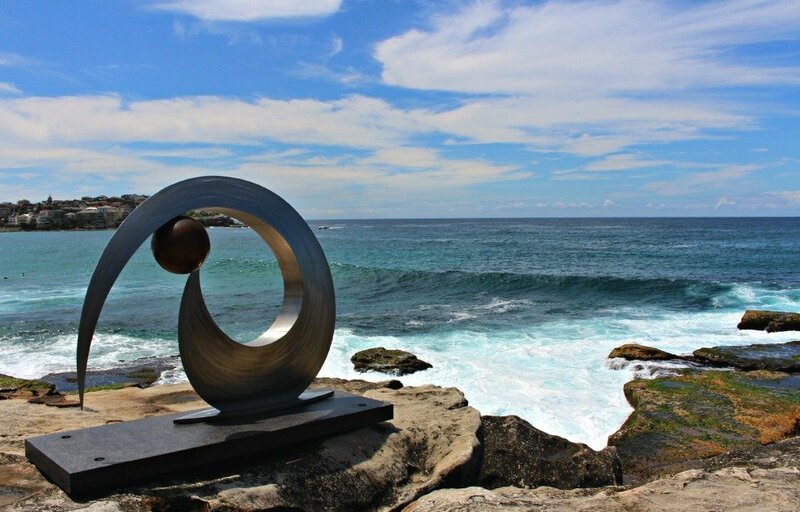 Need free help planning your trip to Sydney? Join our Sydney Expert Facebook Group Lots of our members have made this trip and are happy to help with specific questions. Such a great post! My son is obsessed with learning about Australia at the moment. He is really into reptiles and a huge fan of Steve Irwin so Australia is high on our bucket list. We will keep this excellent, comprehensive guide bookmarked for when we eventually make it down under! Thanks, Sisse I really hope you enjoy it when you get here. could i do all this and Jenolan caves in 1 day or should i book 2 days? I would definitely book two days to cover Jenolan Caves and the mountains if you want to have time to really see anything. Hi. Great article. If we are traveling by car where would you recommend staying? We would also like to tour the caves. Are they close? Thanks Becky If you have a car you could stay in any of the villages. I like Blackheath for the sunrise at Govert’s Leap and Leura is good for night time dining. Lilianfels in Katoomba and the Hydro in Medlow Bath are lovely if you want to splurge.